I must be missing something, because I do not see how to change the UV mapping on Genesis in Poser. Or, perhaps, do I need to update all of my Michael 5 textures to get new files that will apply the correct UV mapping for me? Apologies if this was covered somewhere, 35 pages is just a little much to try to read and comprehend all at once. You need to apply a .duf materials preset - I have one saved that switches to M4, I'll try making a set of presets that do nothing but switch UV sets and put them up later but for now just apply one of the Sample map settings to the figure and then the texture set you want to use. Thanks Richard, but I don't think what you suggested works. Tried that already. Sounds like I should be able to do this myself with the tools provided though, no? Make a preset in studio that just changes the UV's? Convert that over? Or just convert an existing M5 preset over, perhaps? Yes, as I said I made an M4 uv pose and converted that (using the manual method in one of my other posts) and it worked correctly. You do need to note that creating a UV-only preset is a bit of a fiddle as several properties of the surfaces are not at default when you load Genesis, so you need to zero those before using the check modified option in the save dialogue (and even then you will need to deselect the Normal map setting). You also need SR3 for your Poser version. What is "SR3 for your Poser version"?? OK. I have two folders on my external hard drive. One is Poser 9 (where I put everything to work), and the other one is, Poser 9 Content. I use to keep it inside of the Poser 9 folder, but with setting up Genesis in Poser 9, I had to move it on the outside of Poser 9 folder. Now Genesis works for me. My question is: Where do I load my items to? The Poser 9 folder, or the Poser 9 Content folder? Help!!! I'm so confused. Any help would be greatly appreciated. Thanks in advance. OK. I will try that with one item and see if it works for me. Thanks for the help. Thanks Ann. I can now switch from Figures to other parts of my library. But boy! Having the library external to Poser is a a pain! Hopefully, this will be quickly resolved. vfsUtils: cannot find startup script. I installed both files into my Poser external runtime, but would prefer Genesis content be installed in my existing DAZ 3D studio content folder rather than being duplicated in the DAZ 3D content folder AND my Poser runtime. They have narrowed down what is causing this for some people and are working on a fix to resolve it. I just wanted to let those who were experiencing this know it was looked over today and the Software Dev people are hard at work trying to get it resolved for you all. If you’re having issues with switching over to other parts of the library once Genesis is loaded, go into Edit > General Preferences > Library > switch Launch Behavior to External and restart Poser. that fixed it for me. I've just added the DS library to Poser and it seems that other morphs have also loaded into Genesis including custom ones I made for DS4. Is this correct or am I dreaming? No, you are correct - this is no dream! Not only Genesis in Poser. But also a lot of other DAZ only content, like Optitex dynamic clothing. Best plugin ever if you ask me, especially if you use both programs. And for those who do not use both, but will try the best, how to get optitex dynamic into poser? can one use them like poser dynamics? 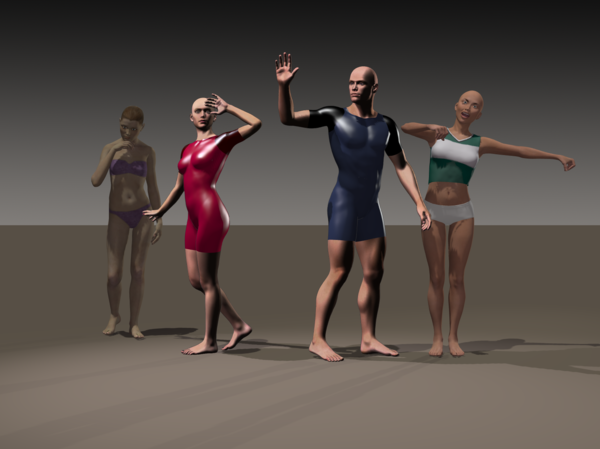 Optitex Dynamic Clothing only works with the DAZ Studio plugin as far as I know. You would do your drape in DS4 then freeze it, and export it to Poser as an OBJ. Not sure if there is a way without using DAZ Studio, i drape it in studio and then convert it to a prop (freezing the simulation) and saved the scene, for which a poser file can be made. Maybe someone knows a different way without studio, but that is a bit beyond my knowledge. 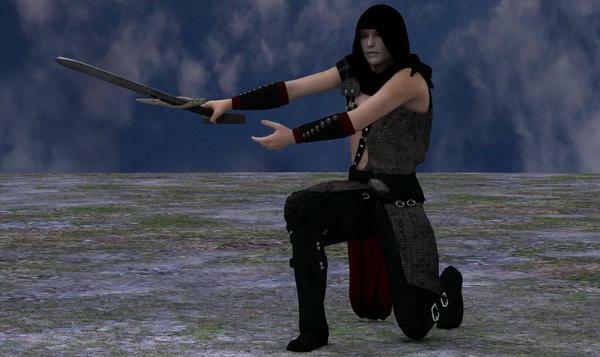 In the past I have exported DS Dynamic clothing as an OBJ and loaded it into Poser to use as Poser Dynamic Cloth. It is a little finiky sometimes but seems to work all right. However, the experiments I've tried simulating cloth on Genesis are... quite slow. It was one of the first things I tried since, by having the V4 body shape for Genesis, I don't need to convert clothing at all to use V4's dynamic clothing on it. You CAN use the optitex clothes in Poser, but you need to load them into DAZ Studio, run one short drape cycle and then export the clothes geometry as .OBJ. You can then import that as a prop in Poser and clothify it for use in the cloth room. I have done it with the Century night gown and it works fine. There is a couple of thing to keep in mind: If the optitex clothing model has multiple geometry options (like the night gown: open, clothed, long sleeves, short sleeves,...) you need to export each one as a separate obj. The two cloth engines are also working differently and thus the geometry from the optitex export might not be ideal for Poser. But generally it works ok. It worked. 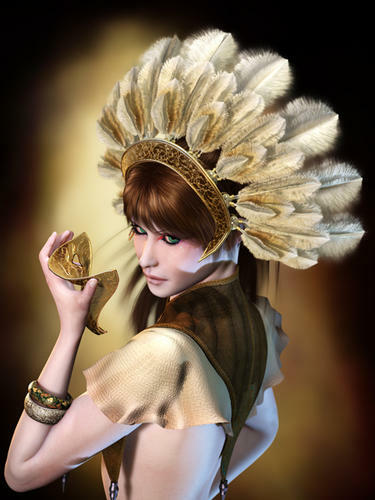 Now if the http://www.daz3d.com/shop/ethnicity-for-genesis-bundle, actually work in Poser. I re-set my downloads, and it still won't work in Poser 9. The DSON is not in there. Can it be fixed? It says it can be used in Poser. A lot of things say they can be used in Poser for Genesis, so I re-set my downloads, and they don't have the DSON in them yet. That's a portion of my first render, which I sent to the Queue Manager. I call it the Phantom Swordswoman. She needs magnets in a couple places, I only Poser-ified a few of the many materials, and the Genesis figure failed to render entirely in the couple hours that render ran, but, hey, it fits the season!!!!!! On the bright side, the background renderer still loves me. Tamesis Human Genesis, all else normal Poser assets. LightMage is parented and posed, since that pose is REALLY simple. However, I got some good advice and originally used the "Copy Joint Zones" function in Poser to automatically re-rig it to fit Genesis and, you know, it looked REALLY good. I wasn't quite happy with how the fluffy, ruffled shoulders turned out, is all, or I would've stayed with that method. But, nope, no DS usage at -all- for that image, it's 100% pure Poser. I seem to be missing the PC installer for Pure Hair Bubblegum - Poser Companion ... all I have are mac installers. Is anyone else having this problem? I reset my V5 Pro Bundle on Sept 29. Will that have the necessary DSON Files or have they been changed since then? They have been changed since then :-). You will have to reset it to see the DSON and Poser Companion files. Hope this helps a little. You're Welcome :-). I think I spent all day yesterday resetting all my Genesis Content...lol...I just wish they would clear out some of the old downloads after you get done dl'ing stuff :-). I did try the Poser Import last night and wow it came through beautifully :-). Now all I gotta do is learn Poser..lol. 1) After I uninstall the importer, PP12 still looks for it on startup and displays a no-such-module error. Why "on win32"? My system is 64-bit. I've gone bog-eyed reading through all these posts for the answer I'm looking for :) I'd be interested to know if there any Poser 9 users here that are able to use the DSON importer without the library totally freezing after the Genesis figure imports with DSON? Windows 7 using the 32 bit version! The list does help, since the itemized order history is only in alphabetical order. If you cannot change library categories (from Figures to Pose, Expressions, Hair, Props, Light, Camera, etc. ), some of us are able to get around the problem by launching the Library outside the Poser application. Edit / General Preferences / select the Library tab and change Launch Behavior from Embedded to External. DAZ is working on a fix. I got a lot of the errors mentioned in this thread, but have since worked through them all. It sounds like it thinks that your main Runtime folder is under Program Files or some other location that is protected by Windows (7, Vista). You could try and change the "Writable Runtime Folder" under Scripts then DSON Support then Importer Preferences and see if that helps? Here's my test renders. The preview render has cartoon outlining even though I selected "texture shaded" for the preview. The other picture is a default render (two steps up from draft with sub-surface scattering). I added the appropriate runtime folder to the Importer preferences but it still displayed the message on trying to load the genesis figures. I also tried editing the permissions for the folder, and also then running Poser as Administrator - so far no dice.